Even though 2-7 Triple Draw Poker (or, Deuce to Seven Triple Draw) has become more popular over the last few years, it still lags far behind Texas Holdem and Omaha. This is the reason you’ll rarely see the game offered in land-based casinos. If you want to play 2-7 Triple Draw Poker, you’ll need to do so online. The good news is that there are a lot of high-quality poker sites at which you can play 2-7 Triple Draw online. We’ll point you to several of them on this page. We’ll also introduce you to the rules of the game, basic strategy, and other tips so you can hit the ground running. Not many sites offer online 2-7 triple draw. The game is a variant of Five Card Draw. This means it should seem familiar to you, even if the rules are slightly different. The biggest difference is that 2-7 Triple Draw is a lowball game. To win the pot, you need to have the lowest hand at the table. If you have never played a lowball poker game, it may be difficult to think in terms of building a low hand. Give yourself time. It will seem like second nature after you play a few hands. As with Texas holdem, doing well at 2-7 Triple Draw requires making a string of smart decisions. It starts with knowing your position at the table. The later you are, the more aggressive you can be since you’ll have a better idea about your opponents’ hands. Also, don’t be afraid to fold once it becomes clear that one or more opponents are holding stronger hands than you. For example, if you’re planning to draw two cards, and others are standing pat, it may be time to throw in the towel. Your starting hands will be influenced by your position at the table. That said, following a few ground rules is important. First, realize that Aces are always high. Second, because straights and flushes count against you when playing 2-7 Triple Draw online, starting off aggressively with suited or connected cards is dangerous. Third, learn to distinguish between premium hands and those that are marginal. Know where to draw the line. Bodog – One of the things we’ve noticed about Bodog is that the average skill level of their players is low. This has been the case for years, which alone is an enormous draw. Bodog is a mid-tier site, so the table traffic and game variety are solid. You’ll also find a strong tournament schedule with events starting every 20 minutes. Visit Bodog and use bonus code “130347” to grab a 110% match up to $1,100. You’ll receive 10% of your bonus instantly. PokerStars – The advantage to playing at PokerStars is their massive table traffic. They are the largest poker site in the world, and draw nearly twice the traffic as their nearest competitor. This means you’ll seldom have trouble finding action at the 2-7 Triple Draw tables. They also offers a huge list of tournaments, a generous sign-up bonus, and poker software that is arguably the best in the industry. 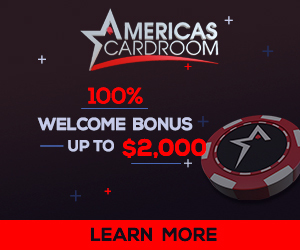 Visit PokerStars and use marketing code “kickasspoker.com” and bonus code “stars600” when you register your account. You’ll receive a 100% match up to $600 on your first deposit. Visit our PokerStars review page to learn more. The poker sites above offer a perfect training ground to play 2-7 Triple Draw online. Each has a long track record, draws plenty of table traffic, and provides a generous sign-up bonus to help you get started.